Saving more money each month is a goal shared among many Americans. With costs continuing to rise across many industries and services, it can be difficult to keep up with the continually rising cost of living. However, there are options out there to help you cut your bills and keep more of your hard-earned money in your pocket – especially right here at Twigby. One of the quickest and easiest ways is by ditching your cell phone carrier and opting in for customer-friendly prepaid cell phone plans. At Twigby, we not only provide prepaid cell phone plan options, but we let you build your own prepaid cell phone plan, giving you total control of your cell phone bill. If you’re hesitant to leave your current carrier and switch to a prepaid plan, consider this – Consumer Reports National Research Center recently surveyed about 90,000 cell phone users and discovered that half of the respondents who switched providers cut their monthly bill by $20 or more! Switching from a traditional post-paid plan to a prepaid plan at Twigby almost always guarantees monthly savings. Postpaid Contract plans are increasingly becoming a thing of the past across many facets of life, and the cell phone industry is no different. When you switch to a prepaid plan and leave behind your postpaid plan, you’re also leaving behind a lengthy contract, bringing more flexibility to your life. Paying up front for your month’s cell phone service can help give you peace of mind, knowing that your cell phone bill has already been paid. And, if you ever need to cancel, you don’t have to worry about early termination fees. The traditional cell phone carriers love to switch up their plans to the point where it’s almost impossible to recall which plan you originally signed up for, at which time, with which special deal, and so on. Then, when you get your bill, many times you often find a nice surprise of hidden fees that you weren’t quite expecting. With a prepaid plan, you’re in control of how much you want to pay each month, and nobody makes it easier and more affordable than Twigby. We provide clear pricing options without any tricky lingo or other caveats, and with prepaid cell phone plans as low as $9/month, you’ll enjoy building the plan that’s right for you in a matter of seconds. There’s a common belief among consumers that switching to a prepaid service and leaving a major carrier will result in a lower quality of service. However, this simply isn’t true. 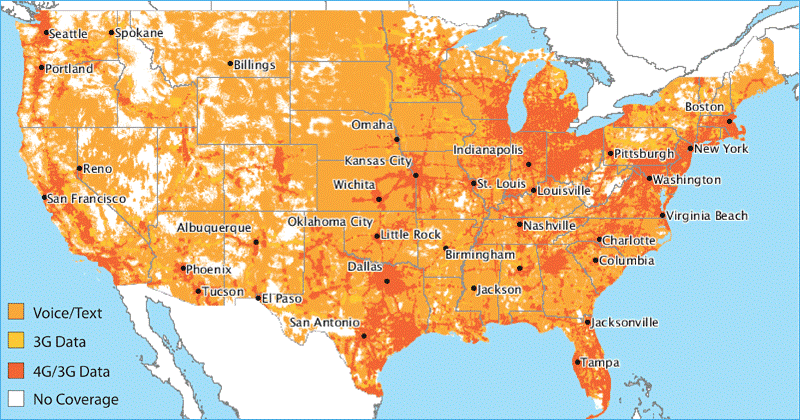 At Twigby, we operate on two of the largest nationwide networks providing high quality cell service across the United States. With a reliable network reaching over 270 million people, we’re confident that Twigby can provide the same level of cell service you’re accustomed to. Instantly see your coverage levels here by entering your address. How much should you be saving by switching to prepaid savings with Twigby? We could list and discuss the benefits of prepaid cell phone plans over postpaid cell phone plans all day long. But, we’d rather you experience the difference yourself. We’re so confident in our service, we back it with a 30-day Satisfaction Guarantee. If you’re not happy, we’ll refund your costs. It’s that simple. Ready to find out how much you should be saving by switching to Twigby savings? Just head to our simple savings calculator, fill out the information with your current monthly bill, and receive a suggested, comparable Twigby plan instantly. We’ll tell you how much you would save by switching to Twigby.